The Aquarium of the Bay enables guests to explore the beauty, magic and wonder of the world beneath the waves of San Francisco Bay. Located on Pier 39 at the intersection of Beach Street and Embarcadero, the 65,000-square-foot facility has marine tanks that hold more than 700,000 gallons of water. Over 600,000 people visit the aquarium each year to view sharks, skates, bat rays as well as eels, kelpfish and sturgeon. Focusing on the waters in and around San Francisco Bay, the aquarium has three main areas. The largest display is the Under the Bay Exhibit, which re-creates the aquatic environment of San Francisco Bay. 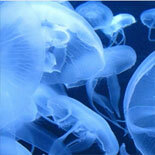 As you walk through the 300-foot acrylic glass tunnel, you can view thousands of animals swimming overhead. The facility is home to marine animals that live in near-shore habitats like moon jellies, Pacific sea nettles and all five local shark species that prowl the deep waters of the bay. The tanks located in the Discover the Bay Exhibit reveal the colorful sea creatures native to the waters, such as the feisty Garibaldi, California’s official marine fish. Other inhabitants include moray eels, anchovies and the Bay Pipefish, a graceful fish that resembles a blade of eelgrass. Like other members of the seahorse family, the male is the primary caregiver for the young. The Touch the Bay Exhibit enables visitors to interact with a variety of sea creatures, including sharks, bat rays and skates as well as sea cucumbers and sea stars. The newest permanent exhibit features river otters that serve as ambassadors for the watershed. The $1.3 million attraction has live crayfish and minnows as well as dry land for Wildcat, Tubbs and Shasta to explore. The San Francisco Bay Estuaries exhibit is an interactive display that focuses on the mudflats, marshes and other wetlands that comprise the bay’s watershed. The PG&E Bay Lab reveals some of the land animals that rely on the bay’s ecosystem, such as California kingsnakes, pinktoe tarantulas and African pygmy hedgehogs. There are daily naturalist-led animal interactions, feedings and hands-on science experiments. The Bay Theater screens a variety of short films about sharks, the building of the Bay Bridge and an animated feature depicting two sea turtles and their quest to return home. Premium events include behind-the-scenes tours and an opportunity to feed the sharks. Open year round, the Aquarium of the Bay also provides wonderful views of the world-famous Alcatraz Island. Planning a visit to the Aquarium of the Bay? Purchase your tickets online and save! Use coupon code SFAQ15 and receive an additional $1 discount. Explore even more of San Diego by purchasing the Aquarium of the Bay and California Academy of Sciences Package.